Two on-trend summer shades create a geometric shawl design with a fun twist. 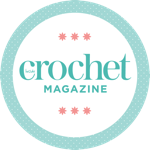 This pattern by Annelies Baes is available inside issue 104 of Inside Crochet. Not a subscriber? Order a copy online and download a digital edition straight to your smart device. Annelies thinks that playing with colours, textures and geometry is so much fun! She tries to encourage people to use their own imagination and creativity. See more of her designs at www.ravelry.com/designers/annelies-baes-vicarno.